As a JCUA organizing fellow, I spent the past year building and growing my skills when it comes to organizing and activism in local, community settings. As I reflect on what it means to do social justice work, and as I transition from a JCUA organizing fellow to a full-fledged member, I’ve begun to understand my activism as what it really is—a love letter to Chicago. I was raised mostly in Oak Park, a few blocks past the city’s westside border, but lived on the northside during my high school years. I graduated from a CPS school, and spent two years at an out of state college. Ultimately, I chose to return to Chicago because I felt an overwhelming desire to once again be part of the city which has shaped my personality. I feel as though I’ve benefited immensely just by being from Chicago, however, many of the benefits I’m so grateful for stem from an overlap between my proximity to all that Chicago has to offer, and my own personal intersection of privileges. For example, my access to top level universities and their libraries, my access to a free, top-rated selective enrollment public high school, and my proximity to all the art, culture, music, and resources the city has to offer to some of Chicago’s residents. My drive for Chicago-based activism stems mostly from this realization, that while I have benefited so immensely from my 606 zip code, others in the city have suffered from it. And, that ain’t right. Although I say that my organizing is my love letter to Chicago because it grows out of a place of appreciation, admiration, and pride in my city, perhaps it might be better to call my activism an investment in Chicago. However, as a college student and a college graduate, it was difficult for me to figure out how I could actually make that investment. I wasn’t sure where to start, where I belonged in these networks of power and privilege and oppression. So, starting with my community—the Jewish community—seemed to make perfect sense. 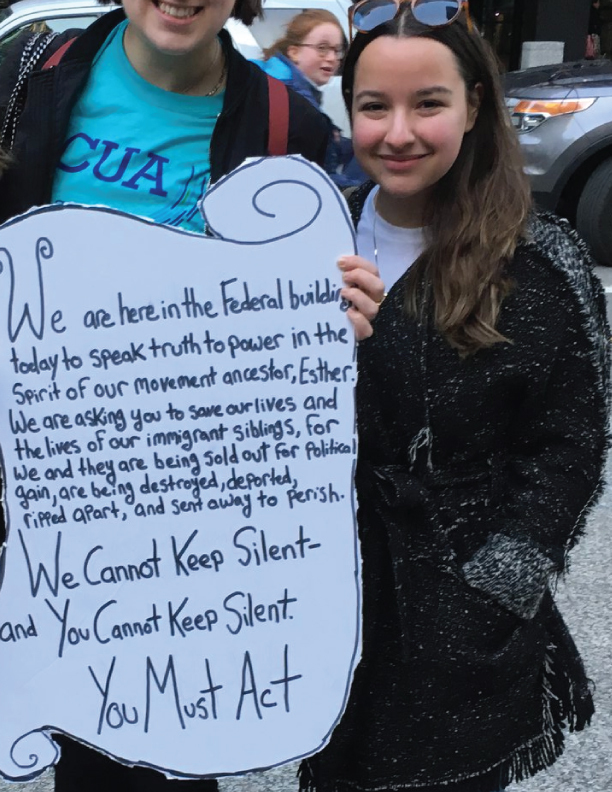 Although I haven’t always felt particularly connected to the Jewish community, JCUA brought together my desire to work on Chicago based organizing, and a need for a community in which it made sense for me to organize. Over the past 9 months, I’ve realized that communities are a fundamental starting place when it comes to real social change, and having the privilege to access the Jewish community is an immense responsibility. As Jews it is in our self-interest to help create stronger and safer communities, to work towards shifts in power from the dominant culture, and to carve out space for ourselves and for us to support others in this work. Last fall, myself and a number of other JCUA members attended a meeting hosted by ONE Northside, focusing on the Illinois state budget impasse. At the start of the meeting, everyone in the room was asked to collaboratively draw on a long piece of butcher paper what they would like to see change in their neighborhoods. There were pictures of safe and high quality neighborhood schools, parks with ample playgrounds, free hospitals, community gardens, and strong relationships with resources readily available to all. Over the months that I progressed through the organizing fellowship with JCUA, I tried to put into perspective how the work we were doing contributed to the creation of the communities we wanted to see. Last month, as I knocked on doors in the 30th ward with another JCUA member as we canvassed for GAPA, the Grassroots Alliance for Police Accountability, I found myself explaining GAPA and the work JCUA is part of in this sense of creating communities we want to see. Community oversight for police is part of the puzzle, and establishing systems that prioritize communities and relationships instead of allowing police misconduct under the guise of perpetuating “law and order” is so incredibly vital to a city that is safer for all of its residents. As I look forward at what my activism will look like in the future, with the JCUA, in my outside work, and in my personal life, I know that I’m continuing my investment to help restructure a Chicago that will support all of its residents instead of just some.